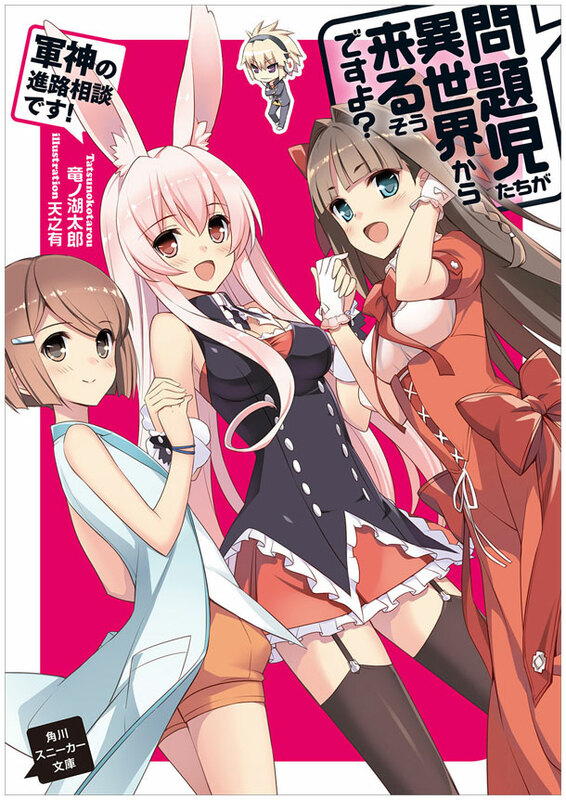 J-Novel Club Forums | Mondaiji-tachi ga Isekai kara Kuru Sou Desu yo? Title: Problem Children Seem to be Coming from Another World? Sakamaki Izayoi, Kudou Asuka, and Kasukabe Yō have tremendous powers and are bored with the regular world. An envelope arrives for each person, and when each opens their envelope, they are stunned to see the scenery around them change to a world they had never encountered before. They’ve been summoned by the Black Rabbit to help the community “No Name” to overthrow the Demon lords. My thoughts: This is a series I'd really like to see. It is completed so there's that. Hell yeah! I really want this one. I really like the characters in this one and we could get the whole 12 volumes before we get 2 NGNL volumes. There is also a Sequal series too right? that would be awesome to get after this one too. I liked the anime, but I was sad since it was really short. I started reading the LN fan-trasnslation a while back and I'm around volume 6. If it gets picked up I would start it from scratch with an official translation though. You got my vote! Yeah, liked the anime and read a bit of LN. Would love to start over if it gets picked up. Seconded. This is one of the only animes that I still rewatch regularly after abandoning anime for light novels. I remember requesting this one in the general licensing requests thread sometime early last year (or possibly even year before last) since I found it to be one of the more fascinating and underrated isekai titles at the time. So yeah, it's a no-brainer for me to upvote this. This series hundred percent gets my vote. I really need this one. As much as I would love it I can see Sam being a bit hesitant to license this since the fan translation has already covered the entirety of the original series and part of Last Embryo. @eternal-wanderer well a lot of people these days don’t even read fan translations anymore (like me), so it might as well be inaccessible since there’s no official release. @eternal-wanderer I thought the first five volumes were not available for the fan-translations. @drone205 Its not hard to find even vol 1-5 if you know what your doing. Not sharing a link though since I don't want to get in trouble. I honestly wouldn't recommend the fan-translations for this as they become ridiculous weeaboo translations which is a shame. The anime series was fun, and I'd definitely like to read the rest of the story. If it's licensed I promise to buy at least volume one. If the written version is as enjoyable as the anime I'll buy all 12.